This page addresses research projects involving non-UW researchers or sites. Increasingly UW-Madison researchers are collaborating with researchers and community partners locally, at other institutions around the country, and/or abroad. When UW-Madison study teams collaborate with researchers and community partners that are not affiliated with UW-Madison, there are special considerations. All members of the study team, whether they are UW-Madison personnel or not, must be covered by an IRB of record. 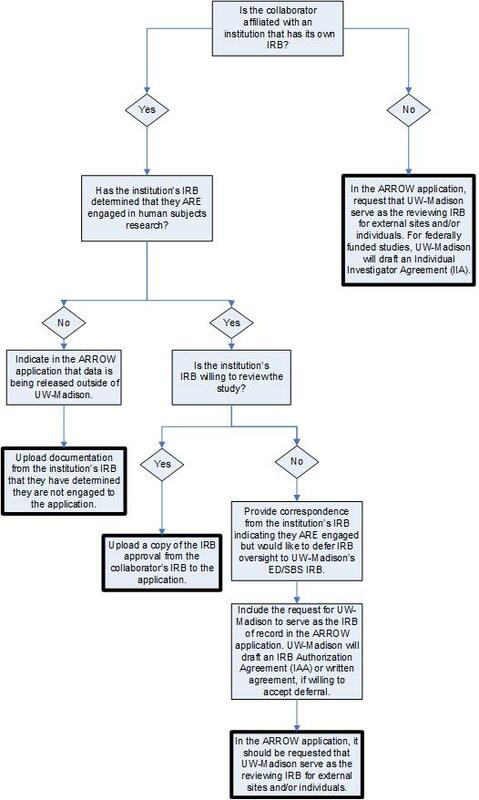 The following diagram can help you determine who should be serving as the IRB of record for non-UW study team members, collaborating on your study. PLEASE NOTE: Per the Revised Common Rule, single IRB review will be required for all non-exempt federally supported multi-site studies as of January 19, 2020. Please contact the ED/SBS IRB Office with questions.